Sorry no pic. for this but it is still enclosed in the original plastic encasing it came in. Coat of arms and CANADA on one side, I think this was a give away with some food item cereal or coffee or perhaps a school handout not sure. Any idea of value? I've got one too. I found a listing for it in Krause's Unusual World Coins catalog. 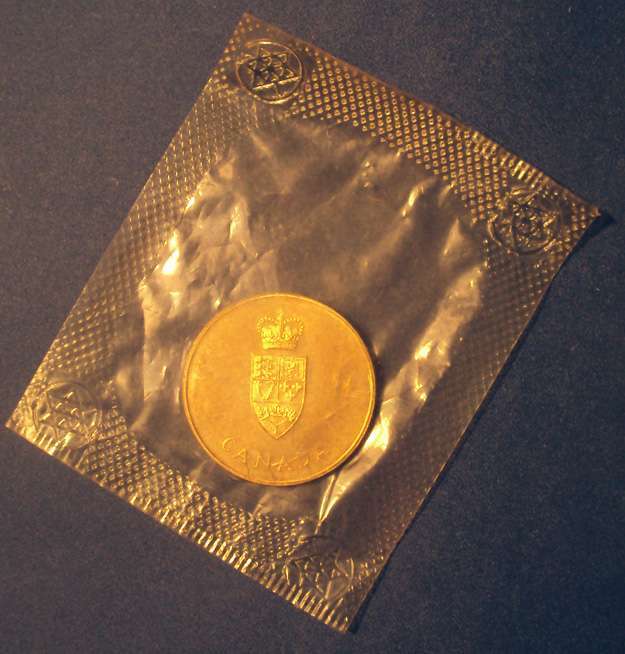 They say it's a Royal Canadian Mint issue and has a face value of one dollar. The obverse is the Coat of Arms. 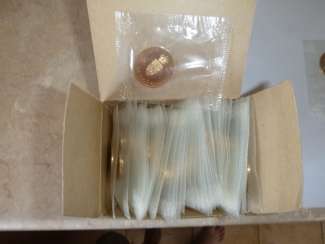 They exhibit a prooflike strike and exist in silver or bronze. 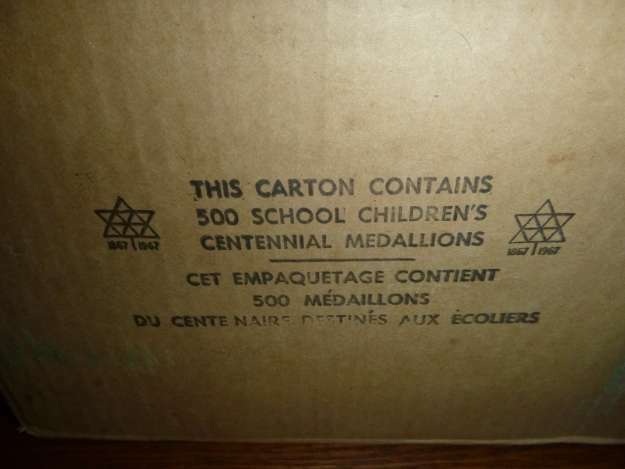 What you have is a Centennial medallion handed out during June 1967 to all school children in Canada from grade 1 through 13. That would be somewhat over 4 million at the time. It had absolutely no face value. 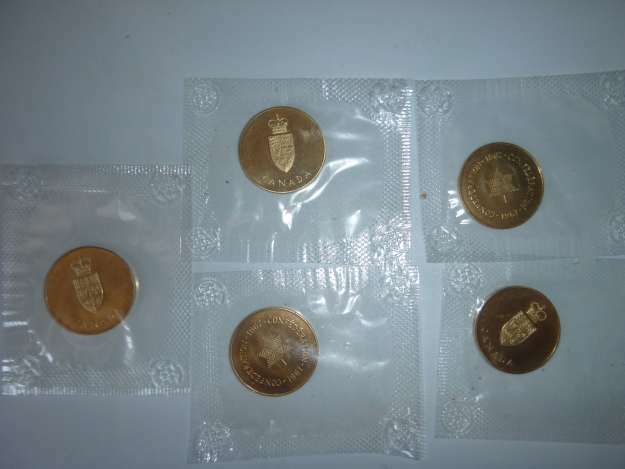 These bronze medallions were all sealed in cellophane with a centennial motif creating the seal. I recall almost everyone (including myself) immediately opened and threw away the plastic so I'd give a hefty premium to those still sealed. After I lost mine I was fortunate enough to buy one of these unopened from a friend 10 years later for a buck. I have no idea who got the sterling silver issue. Today, one "circulated" might sell for a dollar; still sealed: $2-$5 depending on the condition of the cellophane. I'll post photos when I get a chance. 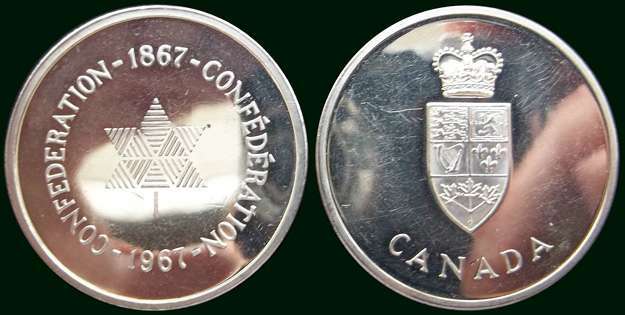 1967 Canada Confederation centennial medallion. Packet measures 2 1/2 x 3 1/4 inches. Another silver 1867-1967 medallion up for bid on ebay. Take a look. This one comes with the vinyl wallet it was presented with. Nice box! Here's more info. about this token. Hey! I see my guesstimate of 2-5$ was pretty well bang on. 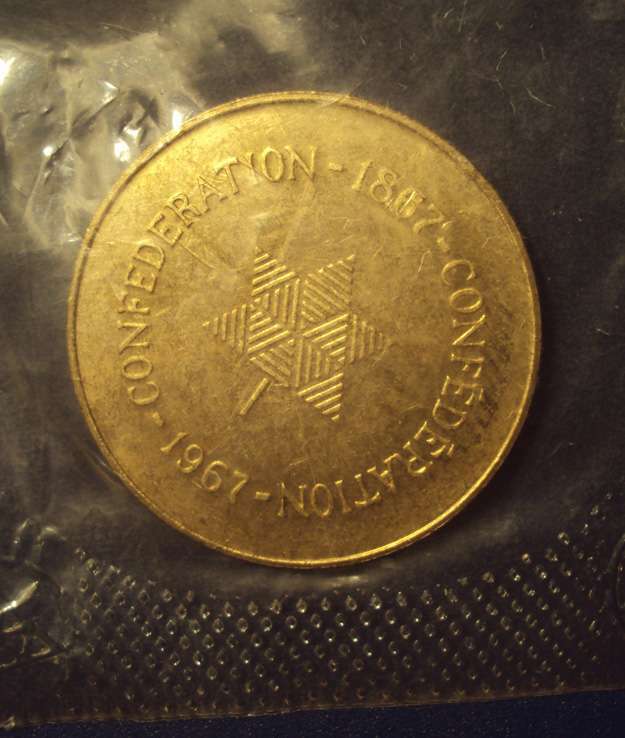 IMO all Confederation medallions still in cellophane are in MS (mint state) grade. From what you've shown I'd go out on a limb and say yours are all MS on the high end. The one I have (shown above) I'd grade much lower. MS60 perhaps. It's been tossed around over time and the cellophane has been breached causing the bronze to tarnish somewhat. Maybe someone with a lot more grading experience can chirp in on what would constitute the differences between MS62 and MS65. Nevertheless, that's quite a collection you have there! For the listing price, yes. But these tokens are rarely sold for more than 1$.